No change in employment picture. Same old, same old. Go back to sleep. Although the main message of the latest BLS monthly employment survey is little or no change, there are some interesting trends we can look at. First the ho-hum stuff – stay with me for a paragraph or two. Job gains of 155,000 this past month was essentially the average of the past twelve months; it is enough just to keep up with population growth. The unemployment rate, number of jobless, long term unemployed, participation rate, employment-population ratio and number of involuntary part-timers all were essentially unchanged. Can’t get more sleepy than that – but stable. 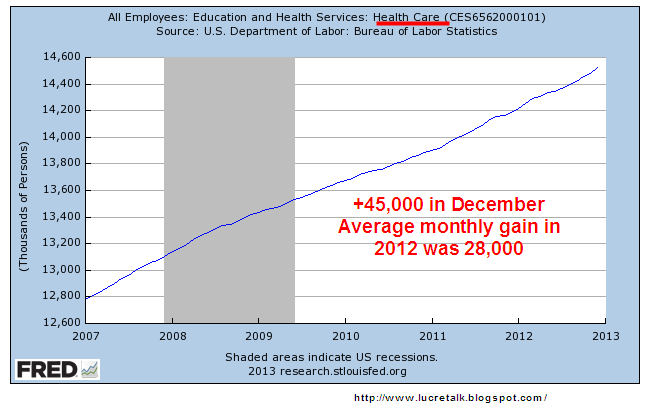 Health care employment continues to zoom upwards, gaining 45,000 this month and averaging over 28,000 monthly in 2012. Over 2/3rds of the gains this month were in ambulatory care and nursing homes. We are eating and drinking out at about the same pace as we did in 2011. Food services and drinking places added an average of 24,000 workers per month this year, same as the previous year. 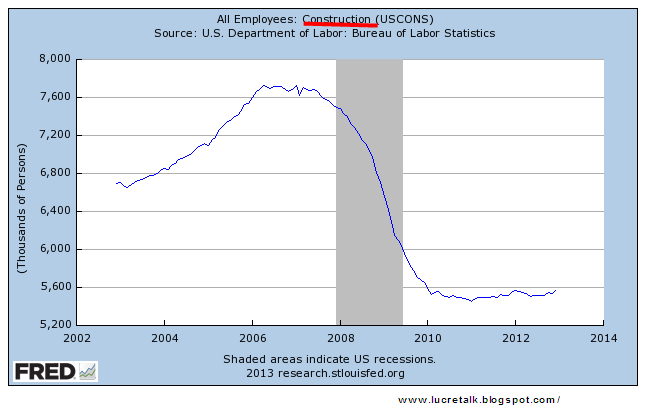 20% of the job gains this month were in Construction but the industry is still flat. Now here comes the interesting stuff. 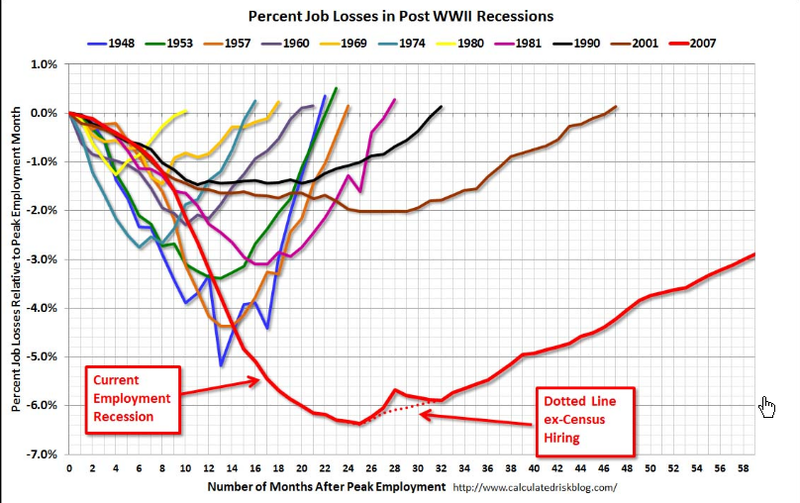 Bill McBride at his Calculated Risk blog for this past week has a chart of job recoveries after recessions. This blog is one I read regularly and is on my recommended blog list. Check it out if you have not already done so. 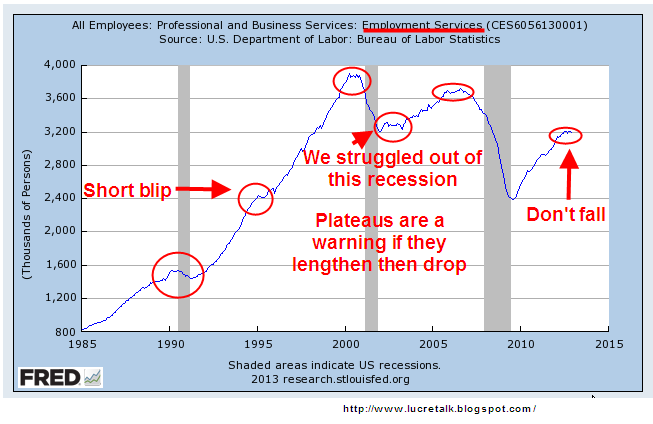 The graph is measuring the job losses from a previous peak; in the past two recessions those employment peaks before the recession took hold were largely caused by bubbles in tech and real estate. I wanted to get a more reasonable baseline to measure change. 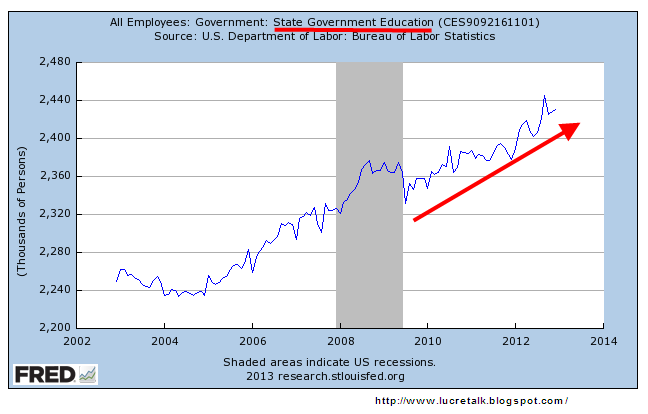 Below is a 75 year graph of the rolling five year average of employment in this country. 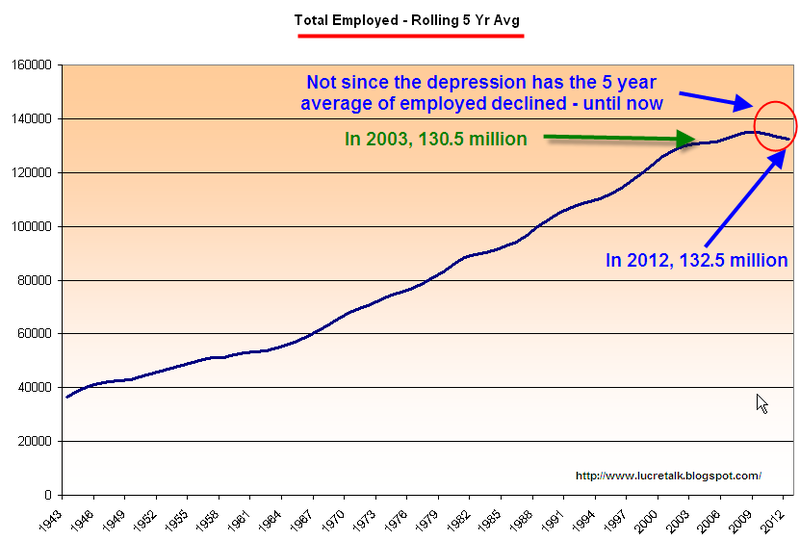 It dramatically shows just how weak the job market has been – depression era weak. 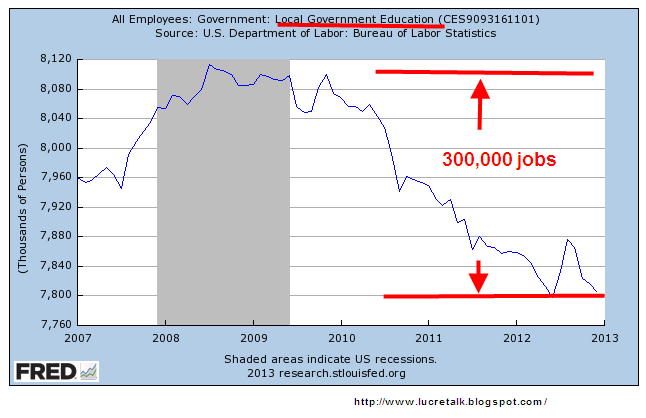 What surprised me in this past month’s report was the further loss of 13,000 jobs in the government sector. I was expecting few job losses, even perhaps a small gain. When we look a little closer, it gets interesting. Since the beginning of 2010, 300,000 teachers, administrators and other workers in local government (these are primarily K-12 schools) have been laid off. We would expect at least some layoffs at the state education level, which consist mostly of colleges, including community colleges, and universities. Not so. Employment has continued to rise. As property valuations have decreased, so have the taxes based on those valuations. The states have taken their share of the taxes and left local county, city and village authorities to wrestle with the budget challenges. Many K-12 teachers have been laid off as a result. Now I’ll look at some cautionary signs. Professional and Business Services has seen fairly strong employment gains and employment in this area has reached its prerecession peak. There is one subcategory, Employment Services, that can often serve as a harbinger of weakness or downturn. These are the guys whom companies hire to do the hiring. When employment at these services weaken or fall, there may be something going bad in the fridge. 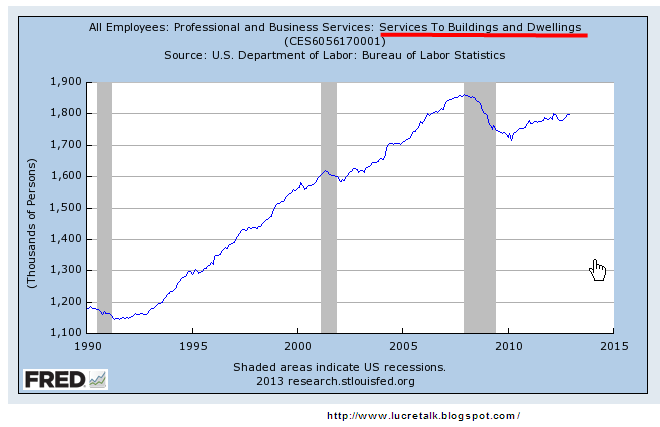 Another employment indicator is the maintenance and service of buildings. When stores, industrial spaces and office buildings are vacant or slow, there is less to do. Doing business takes some wear and tear on buildings. Less business, less wear and tear. 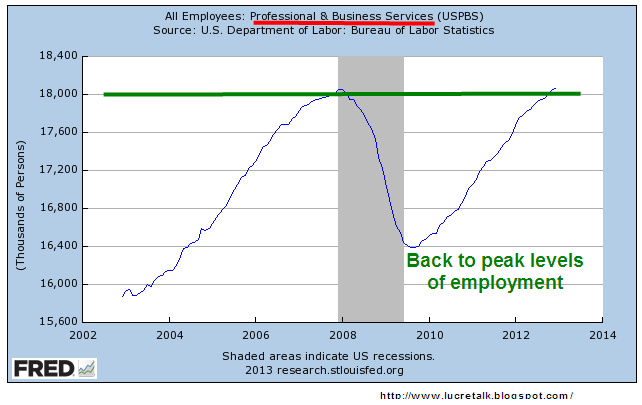 This a truly historic downturn in both the economy and employment. The lack of reliable, or at least comparable, data during the 1930s depression and earlier severe recessions make it difficult to do a proper assessment but we can say – to use a technical term – its a doozer. When I hear someone comparing this recession to the 1980s and advocating, with the assertive crystal clarity that only the uninformed can summon up, that the same policies that got us out of the recession of the early 1980s will get us out of this extended recession, I know I am listening to a fool. When I hear someone firmly pronounce that pumping vast amounts of federal money into the economy, the tactic tried with arguable success during the 1930s Depression, will solve the problem, that is the chatter of another fool.